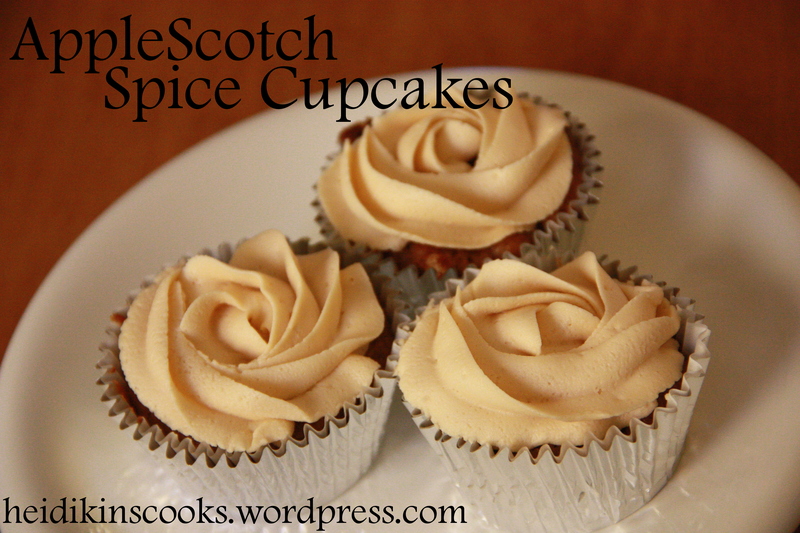 These cupcakes taste just like fall, roasted apples and butterscotch and spice. They are absolutely delicious and were a huge hit amongst my coworkers (also, this recipe makes a ton of cupcakes, or one bundt cake, if that’s how you roll). Peel, halve, and core the apples. Roast cut-side down, on parchment paper on a rimmed baking sheet, 20-25 minutes, then dice. While apples are roasting, mix dry ingredients together with whisk, dump in all the wet ingredients and fold in apples. Bake in lined cupcake tins (makes 18 full size + 12 mini + a little more for, um, tasting), filled 3/4 full of batter. Bake 20 minutes. Or, if you want to bake it in a bundt, makes sure you grease and flour it well and then bake for 60 minutes. Cream butter and 1 cup powdered sugar until fluffy. Add scotch ganache, butter flavor, vanilla, and salt. Mix well. Add powdered sugar, 1 cup at a time, until desired consistency. Add cream to thin when necessary.